The G20 summit in London is a key moment to achieve results that will help end the present financial and economic crisis and prevent future ones. I am confident that we will deliver. For the sake of preserving and creating jobs and prosperity, here in Europe and worldwide. The present crisis is the first big one of the globalization age. Indeed, some people blame it on globalization. They advocate "de-globalization" as the way out. Plausible as it sounds, it is dead wrong. 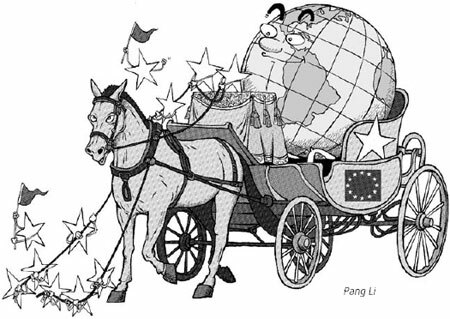 The way out of this crisis is not "de-globalization". Protectionism and economic nationalism are false friends which fuel poverty and conflict: we saw that in the 1930s. The way out of this crisis is "re-shaping globalization". We need to establish a global set of rules that allow us to master globalization. It is only by working together across borders that we can put the potential of the markets at the service of the citizens, and address global challenges like climate change, energy security and fighting poverty. These rules must be based on values and ethical principles. They must combine freedom, responsibility and solidarity. They must make sure that markets reward hard work and initiative, not mere speculation. Now the European Union is uniquely equipped to become a driving force towards a values-based, rule-based globalization. There is no other region anywhere in the world that has a similar experience of agreeing on trans-national rules and of implementing them effectively. Our joint assets - from the internal market to the Euro - have been invaluable for the stabilization efforts undertaken since the crisis began, and they are the best platform possible for our recovery. The European Union has agreed to go to London with a common message. We have taken swift and decisive joint decisions. We have put forward a huge stimulus package: the efforts of the Member States and of the EU level itself taken together amount to over 400 billion . We have acted in coordination to stabilize our banks. We have helped Member States in need, i.e. Latvia, Hungary and Romania. We have devised a comprehensive blueprint for more effective, safer financial markets. The Commission has brought forward measures to strengthen capital requirements for banks, improve deposit guarantees and reinforce regulation of credit ratings agencies. We have proposed improved cross-border supervision of important financial undertakings, including a new body to monitor the overall build up of risks in the system and to take preventive action. Proposals on hedge funds, private equity and executive pay will follow in the coming weeks. Moreover, EU leaders already agreed at the Spring European Council in Brussels to support a substantial increase in the crisis-fighting resources of the International Monetary Fund to which Europe would contribute 75 billion. This comes on top of the doubling of the ceiling of our intra-EU balance of payments assistance to non-Euro zone countries to 50 billion that was also decided. We will continue leading by example. We will engage our international partners. We will work hard for agreement on all four of the key issues. One, a large, coordinated and sustainable economic stimulus, to limit the effects of the crisis on our citizens, and to re-ignite the real economy. Two, restore trust and confidence in the financial system. Not for the sake of the banks, but for the sake of entrepreneurs and workers in the real economy who need credit. We must go forward quickly with measures to get banks lending again, as we have agreed to do in Europe and as the US is doing. This means ending the uncertainty over the scale of banks' losses by removing so-called "impaired assets" from their balance sheets. At the same time, we must strengthen supervision worldwide and fill the gaps - including by calling a halt to tax havens. This requires a comprehensive reform of the international financial institutions. Three, a strong message against all forms of protectionism and for opening up trade by moving ahead with the Doha talks. And four, last but not least, a fairer world: reinforcing our commitments to developing countries and to making the IMF more representative. Developing countries must not pay the price of a crisis created in developed ones. They need extra help. A global instrument for trade finance is one step the EU is proposing. We need the contribution of the developing countries to address global challenges. One example is climate change. We want to reach a global deal at the Copenhagen conference later this year. We have a very significant global convergence of ideas already, most notably with the US. It is notable too that much of that consensus has emerged around Europe's own ideas and economic model. The US Recovery Plan, for example, emphasizes measures to improve healthcare and protect the vulnerable as well as longer-term investment, namely in infrastructure. Measures that were taken already in most of the EU. They pay dividends not only in terms of limiting hardship. In a downturn, they automatically ensure that demand in the economy is sustained and that people are kept in jobs. Because we have these "automatic stabilizers" in the EU, any comparison of spending between the US and EU is highly misleading. This is why our positions on the overall scale of the stimulus are closer than they may at first appear. We see the same convergence trend on regulatory questions. So there is plenty of consensus going into the G20. The challenge is to turn it into concrete steps to put things right. Europe is rising to that challenge. We are confident that our partners will do the same. I want our citizens to know that their concerns are at the heart of what we will discuss and decide. I am aware that many people fear for their jobs, their mortgages, or their savings. Indeed, my No 1 concern at this stage is making sure that everything we do helps employment. It is by transforming our good intentions into joint actions in London that we will meet their justified expectations. The author is President of the European Commission.